People sometimes think it's a problem if they have less than full-time hours to work on their business and deliver their services. Especially when your kids (or other lifestyle factors like a health condition) need your daily care and attention. I know I used to! In fact, this belief used to drive me to squeeze what felt like 12 hours of work in a 5 hour work day. That's when I realized I was going about it all wrong. A small boutique practice is only an asset when you do small, the right way and think bigger then your perceived limitations. One way of thinking about how much time, energy you have for your business (marketing, client care, all of it) has you feeling like a victim and at the effect of your life. I don't have as much time! I can't/don't want to travel as much! I don't have as much energy as I used to! I can't stay up late anymore! And if you pause long enough to recognize how these thoughts are influencing how you feel, it can dampen your resolve to thrive in business. Even if you don't have a family life, or your kids are grown, you can also feel reluctant to give up that precious work-life balance that you envisioned would come with a coaching business. But I've come to see this quite differently and it's become an integral part of the Happy Little Practice Method. You develop little toleration for B.S. And in the B.S. of your potential clients. You basically get over your self really fast, and start making decisions. Why? Because you don't have the time to waste. At least if you have to earn a serious income. No convincing. When a potential client starts to tell you why they can't hire you, before they've even spoken to you, you say okay, but I work with people who want to do this work and solve the problem I solve, and move on. No people pleasing. When a potential client compares what you do to what others offer (pricing, structure, coaching style), you're not interested nor are you defensive nor do you engage in convincing. Offering a service based solution is not about people pleasing. You understand that client engagement is a lot like dating. If they need to think about it or go date other people first, they're not ready for you. No red flags. You do not ignore potential clients who show up late for their first call with you or call from "on the go", or seem to be chronically disappointed in others, or can't remember why they're calling you, or didn't do their homework before they get on the phone with you and other situations that feels like a "red flag" to you. You understand that how a client is from the get-go is how they always will be with you throughout the coaching relationship. No excuses. Potential clients who tell you they can't afford it before even speaking to you... (okay then, why are you calling me?) When I didn't have any money, I just went to the library and used what I have. Or signed up for stuff that was within my budget and did the work. You understand that there will always be folks who can't afford what you offer, and that's okay, because there are other ways for people to help themselves. Standards of who you work with. Standards of how you work. It's not about being inflexible, it's just about having standards that allow you to be YOUR best and do YOUR best work. Your 25 hour work week must be worthy of your time and attention. And it must be a positive influence in your personal life. Or else why bother putting in the sweat, time, energy and personal growth on steroids that a thriving practice requires. P.S. Want help with this? If you haven't already, grab a cup of tea, pen and paper and watch my webinar that explains my Happy Little Practice Method and see if it's for you. Then if it makes sense, apply for a time to talk with me and let's see if we might do some great work together. June - I'll be leading a virtual business development training for Wellcoaches.com grads in June. More details to come! Would you love to bring me to speak at your alma mater? Just shoot me an email or send my speaker info page to the powers that be. One of my clients just shared with me that, for the first time in her practice, she felt comfortable taking time off for spring break. When she didn't work, she didn't earn. This made for a business that serves clients at the cost of your own mental, spiritual, emotional and family well-being. This makes things unsustainable for the long-term. All of her clients are in start-to-finish programs instead of hourly packages or sessions. This means, when she wants to take time off, her pay isn't affected. Her clients have either paid in full for the duration of their work together, or committed to a convenient monthly payment plan that is set up once at the beginning of their work together, and automated to process without her management. I'm taking next week off too, to hang out with my little kids during their school break. I can only do this because all of my clients are in programs too. If you're finding yourself in a "can't take time off" type of situation, here are a few things that may help. Camp 1: you may have a program that you created but don't have enough people to offer it to and/or not enough are saying yes. Camp 2: you are offering hourly sessions, or small packages of sessions, and it's exhausting you. Both situations require you to change and evolve. No matter what camp you're in, here are two tips and a free training that may help. TIP #1 - Make sure your program solves a specific problem. ONE problem, not ten of them. Otherwise people simply won't believe you. You may have to chunk down what you do into phases to make your work seem doable and believable. For example, phase 1 of my work is integrating everything you do under ONE message and phase 2 is getting your work out into the world simply and effectively, usually by speaking your message. I offer both of them, or they can do just one, no problem. But each one solves two very specific problems my ideal clients have. Tip #2 - When you tell a potential client about your program, show them HOW your program will solve their problem. People were loving the session until she talked price and then they bailed. Turns out, there was a missing piece in her conversation. The conversation was too heavily focused on creating rapport and talking about the power of coaching. Here's what I see you're doing that is not working and how it's creating the results/symptoms you do not want. Say it nicely, calmly and clearly. For example, "as it turns out, the way you're eating is the perfect recipe for depression, anxiety and stress. The foods you eat actually cause the feelings you're feeling, as I suspect you may have a food sensitivity and allergic addiction to these foods, otherwise it wouldn't be a problem for you." For example, "You don't have enough clients, because you're not marketing consistently and your message is unclear so it doesn't land with anyone beyond the low-commitment, low pricing type of clients who don't want to risk more then a few hundred dollars and don't really do much of the work." Gently point out what's not working and what needs to be fixed. Then move on to step 2. 2) So here's my approach to resolving this, once and for all. Describe how each step of your program will solve the problem(s)/symptoms she or he is experiencing. This is where you essentially show them the way out and how you would handle the situation. Most clients are "lost" in the land of their problem in some way (totally normal), no matter how brilliant and accomplished they are. So if they're lost, you need to act like the smart, capable guide you are and LEAD them the way out. You will need to act like a leader, not a counselor/coach in this part of the conversation. They'll either want to go on this journey with you or not. In fact, I rarely have talks about objections with clients. It's either a fit or not. No convincing. I might, occasionally go into convincing mode when I see a potential client I REALLY want to work with about to do something silly like (spend all their money on branding and web design instead of figuring out their message and marketing first). Okay, I promised a free training on this as well. Here it is: I gave a presentation on how to create your own start-to-finish, signature program for Hawthorn University that you can watch for free here. If you think you might want me on your side as you make all of these decisions around your offers and your practice, I'd be glad to talk and see if it's a fit. Apply for a free time to talk here. P.S. Maybe you can't take the time off this year. No problem, this time next year can be totally different for you. 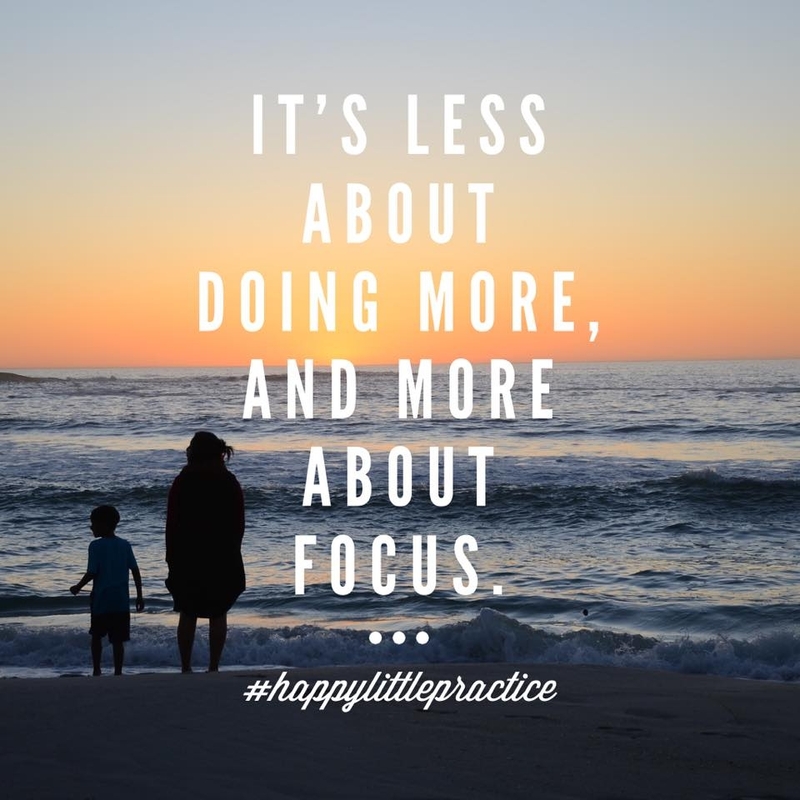 Book a time to chat and let's map out a plan for creating a Happy Little Practice that does what it's supposed to do for you, your clients and your family. Do you know what I mean by "market saturation"? And is it something you should be concerned about? Said even more simply for professional coaches like you and I: there are a lot of other professionals offering similar services to your business in your area or industry. - a marketing strategy loses it's effectiveness, or what was once good enough before many other professionals set up shop, isn't cutting it anymore. For new coaches, it's looking around at the playing field and thinking "I don't even stand a chance!" or, "do I have to invest 10K in a website before having one client just so I look the part?!" Listen, you may not be able to win the game of "who has the most clients" and who can "out market or out work" the other. In fact, it can be disconcerting if you're like me and my clients whose days of "out working people" are long gone with mornings, evenings and weekends dedicated to family life. Then you are going to have to ZIG where they ZAG. Market saturation is simply forcing you, me and all of us, to evolve and step into the changes you likely have been putting off for some time. (or is afraid of doing!) and specialize in solving one very important problem for one group of people that you can become masterful in serving. This puts you in your own league. clients, they are better and more deeply served. That I can do. So I showcase that in my work. You can do the same. 2) Instead of lowering your prices and trying to keep pace with other struggling, charge-by-the-hour professionals, be the boutique coaching business in your field that cherry picks her clients and has people apply to work with you because you're so specialized and you actually have standards of care. I knew I couldn't afford to lower my rates. I was not going back to that! So then, I had to validate my rates. I do this by showcasing my experience and the experience my clients receive that is one-of-a-kind (they feel seen, they get coached by me, they can connect with me each day, etc). For some people, it's a game changer to have that kind of personalized attention. Most of my clients are already doing this but not showcasing this in way that highlights this as the gem it is. You can do this too! 3) Instead of trying to nail your brand, showcase your MASTERY of your craft. Learn how to create, collect and display outstanding testimonials from the work that you do. And the really good people charge upwards of 7K and up for a custom website. Which means, the "average" personalized web work is $2500 to $3500 and I'm so over that level of work. It ain't that great! So, I zig where others zag. I have a super simple, clean, modern website with no fancy branding. I've gone minimalist in a sea of gorgeously branded websites. wear at all of your signature talks instead of spending hours each morning tossing through all your outfits and turning your closet inside out. of the glamour shots I see everywhere... it's me, the beautiful countryside in my pictures, and no perfect hair and make-up). And then I bring it home by nurturing the relationships I create through my emails I send a few times per month, instead of a few times per week. I could go on in the ways that I zig where others zag. I teach my clients to do this too, because it's what they CAN do well, and do so consistently. So if you're worried about any aspect of market saturation in your field, just remember. It's just an opportunity for you to zig where they zag. Fine tune your message and get specific so competition becomes irrelevant. Create a league of your own. do your pricing... everything!... mirror that focus and watch yourself no longer have to play the game that others play. Want me to help you do this? Get in touch and let's see if we're a match. Here's to small truly being the new big, when done right! And yet, it doesn't really feel like that every day, does it? At least not for me and the people I know. This is something I talk to clients quite a lot about. "I can't believe I'm being paid to be myself and share what I know! Amazing!" "I don't think this is working! I don't know what I'm doing! Ahhh!" I created a 3 minute "driveway" video (the bottom of my driveway being the bus stop) about how this shows up and what to do about it here. Instead you want to expect that more or less, you'll find some things challenging. And, learning and growing is naturally uncomfortable. Not everyday, but sometimes. So I want you to welcome the discomfort. Don't turn away from it by stopping what you're doing, changing your mind or fantasizing about an easier gig. Because running your own show is so dang worth it. Most every single day, I sit down and tidy up my mind. Just like I tidy up my home after the chaos of getting kids out the door, and before I sit down to work. I sit with the thoughts that I feel "are happening to me." The ones that make me feel like I'm quietly suffering in some way. And then once I understand them and see if they're serving me or not, then I spend a few more minutes deciding what I'll think for the day. And then I repeat this nearly each day. I don't wait until I'm stuck. I get in there, and see what's doing before it messes with me and my ability to support my family in a powerful way. Maybe you'll find it useful too, like many of my clients. And if it's not a match, look at your own expertise or healing work that you do with clients. Is there something that you do, that helps them with their mindset, that you can use in your own business? One of my clients, a therapist and sports psychology coach for dressage riders, uses the Emotional Freedom Technique (EFT) with her clients to help them break free of beliefs that hold them back. So she started using EFT as her own mental warm up before she sits down at her desk to work. She says it clears her mind and energizes her for the day and allows her to get her marketing DONE. I hope this inner game tip is useful to you. The mindset stuff is the ONE thing that seems to mess with my client's ability to market consistently, beyond making sure their business structure is simplified. the structure of your business so that it's consistently doable (your message, audience, services and marketing) and how to navigate the inner stuff that naturally comes up. And doable you can do, right? Get in touch here if you're ready for a marketing and mindset coach and let's see if I can help. P.S. 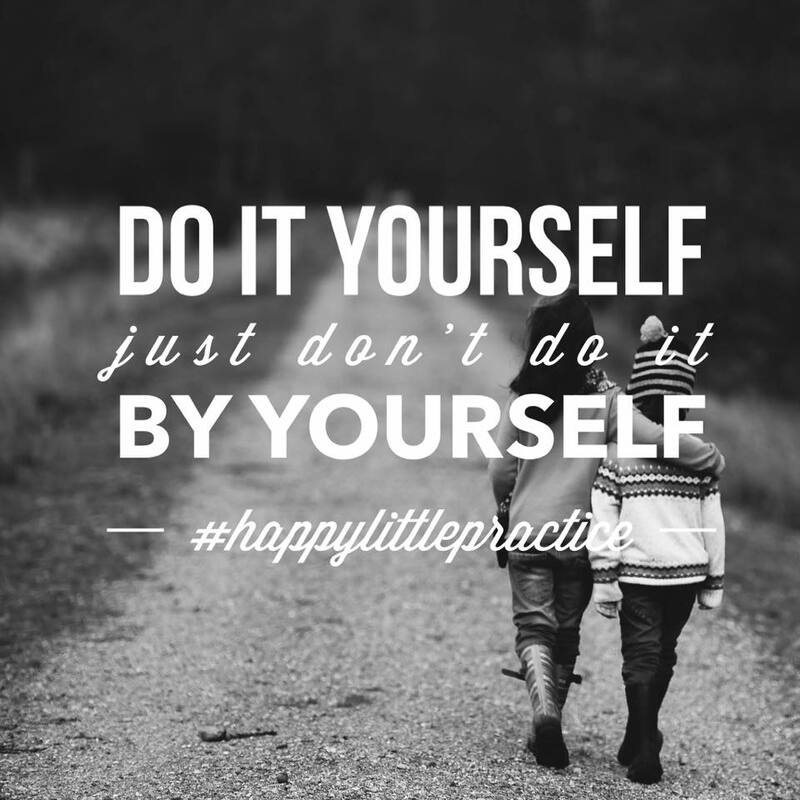 Have you watched my free training on how the Happy Little Practice Method works to simplify everything in your business yet? It was created out of necessity for people like me: working moms who have a full family life and yearn for a simple way to make a serious dent in the family bills, while doing meaningful, impactful work on less than full-time hours. oils, nutrition, mindset, meditation and so much more. spiritual counseling, channeling and more. one with a different focus. One day you're hosting a cooking class. Another you're promoting a cleanse. The next time you're doing a food and mood program. And then your audience doesn't ever really know what it is you do. you might feel a whole lot of resistance. You don't have to eliminate all the different things you do. For example, one of my clients came to me as a holistic health coach. cooking classes and recipes), and more. are ALL so interesting and engaging to her. change before they realize they need to care for themselves. So when her parent passed away, it was a wake up call. after years of ignoring their own needs and self-care. after a big transition in their life. and... you see where I'm going, right? message for ONE very specific group of people. audience and restructuring your services into a boutique business? The life changing magic of tidying up your business. You've probably heard about the hugely popular book by Marie Kondo on the Japanese art of decluttering and organizing. I haven't read it, but I whole heartedly subscribe to the power of tidying up any area of your life, especially your coaching business or private practice. In fact, I'm utterly fascinated by the power of taking care of your environment in this way. I've seen a direct correlation between a tidy business life and making more money and feeling clear and happy about the direction of your life's work. But to be honest, tidying up is not particularly easy for me. I rather do about 100 different things like work with clients than run my business numbers, update my computer, or make the time to get rid of old stuff that's energetically weighing me down. Yet I'm a natural organizer. In fact I do that for my client's businesses and ideas. But I have always felt that everything outside "doing for others" just could wait until "later." Problem was, "later" never arrived or when it did, things were such a mess that it required eons of time to clean up. I'm sure you can relate. You're good at what you do, and caring for others, but you tend to put off the care of your business tidying. In one way, it worked for me. My business was organized, and so it thrived. But my life as a whole was somehow suffering. It was hard to enjoy what I created and I yearned to feel at peace with my journey of entrepreneurship, instead dealing with a baseline of anxiety from wondering if my vague business practices would hold. Deep down, I knew they wouldn't so energetically, it kept clients away. We coaches and solo-practitioners are fantastic care-takers of others and pretty lousy at caring for ourselves. Sure, we'll spend money on the best vitamins and body work, we easily value wellness. But when it comes to decluttering and organizing our work life, we put that off. I'd like to invite you to think about this differently. 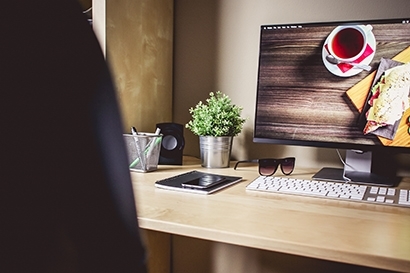 The care and maintenance of your work life environment is an act of self-respect. Making the time to tidy up your business says you are a professional, you care, and your work is worthy of your time and attention. I know I feel that when I'm around someone who has their stuff together in this way. They somehow seem to ooze a level of self-respect that is admirable and inspires confidence in them. It makes me sit up straighter and makes me want to be my best. I know you want that for your practice too. Come, let's explore the art of tidying up your work life. Your time, your office, your computer, your billing and more. Then and only then, will your work become a work of art. Only then will your life feel like like it is becoming your greatest creation. So here's to tidying up AND rising up! We start Monday, July 20th. PS - This is designed just for you - a personal development coach or solo-practitioner. No need to try to do this on your own or read a ton of books and take complicated organizing programs that may or may not apply to your style of work. I've got you covered in one short and sweet course.